The commonsense view of pain is that it's a result of damage to the body. In the 17th century the French philosopher René Descartes developed a "rope-pull" model of pain. Just as pulling a rope in a church tower rings the bell, Descartes thought that tissue damage in the body is a tug that causes the sensation of pain in the brain. For centuries following Descartes, Western doctors regarded pain as a sensation that could be explained by neurology. The intensity of the pain was thought to be directly proportionate to the degree of damage to the body, which would mean that if different people had the same injury, they would experience the same pain. If no obvious physical cause could be found, often the patient would be accused of malingering. In the last half-century, views of pain changed dramatically as scientists discovered the extent to which it involves the whole person--the mind as well as the body--and research using sophisticated new methods shows just how complex pain really is. 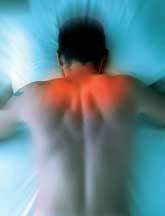 The leading professional body of pain specialists, the International Association for the Study of Pain has come up with a definition of pain that most health professionals use when assessing physical pain problems: "An unpleasant sensory and emotional experience associated with actual or potential tissue damage, or which is described in terms of such damage." They add that "pain is always subjective." The key point is that pain is an experience. As anyone with chronic pain knows, that experience is deeply personal, and scientists are finding that the way you experience pain is influenced by many factors in your life. Emotions, beliefs, and attitudes that are influential in your society and culture, as well as past experiences, all play a role in how you perceive the experience we label "pain." A great deal of research is taking place into the experience of pain using modern scanning and imaging techniques. In recent years, imaging techniques such as Positron Emission Tomography (PET) and Functional Magnetic Resonance Imaging (fMRI) have for the first time enabled scientists to scan the brain while doing active experiments. They can see pictures of the brain at the very moment when a person is having a painful stimulus, and results show the perception of pain is very complicated. The brain makes sense of stimuli from the body by creating an image or representation that scientists call the neuromatrix. The brain compares incoming signals with what's expected, using the neuromatrix as a guide in identifying their location, quality, and the degree of threat the signals offer--while ignoring familiar sensations such as the contact of clothes and the skin. But pain isn't a normal experience so it grabs the brain's attention, overriding other claims. This, then, affects the perception and discrimination of other sensations and emotions, and scans even show changes in the brain of someone living with chronic pain that are associated with the heightened sensitivity they feel. This more complex understanding of pain challenges many assumptions. For example, you'd think that if a person has back pain, detailed MRI scans would allow doctors to see the cause of the problem. In fact, in a study where a number of people without back pain were scanned, 64% had disk abnormalities in the spine, while in another study of people with back pain, 85% had no obvious damage. Research also shows huge individual variation in pain perception. Two individuals given the same pain stimulus while being monitored in the scanner can show vastly different brain activity. One well-established view of pain is the gate control theory developed in the 1960s by Patrick Wall--a world-renowned neuroscientist who specialized in studying pain--and his collaborator Ronald Melzack. They suggested that there are "gates" in the nerve junctions, spinal cord, and the brain's pain centers. For you to experience pain, these gates need to be opened, which is what happens when a healthy person is injured. Pain messages are a signal to protect that part of the body that helps it to heal. The gates can also close, which means pain is reduced or stopped. Again, this is what happens in the case of a healthy person when healing is complete. Opening and closing these gates is a complex process that is affected by emotional states, mental activity, and where your attention is focused. Whether the brain expects pain or is primed to detect any damage or strain also has an impact. When you expect pain, the pain pathways (or gates) open, so the brain doesn't miss anything--and the pain experience is amplified. People with chronic pain commonly report they manage some pain effectively, but a sudden, unexpected increase in pain feels much worse because of the fear that it's caused by new damage. The anxiety causes the gates to open or to stay open longer. Many researchers are searching for ways to close the gates in people living with chronic pain, so their nervous system can return to normal functioning. Mindfulness training may be one way to do this because it calms the whole mental, physical, emotional, and nervous system, allowing it to return to a state of balance. The view of pain that's emerging from research includes the mind, the body, and the environment. As Patrick Wall wrote: Pure pain is never detected as an isolated sensation. Pain is always accompanied by emotion and meaning so that each pain is unique to the individual. The word "pain" is used to group together a class of combined sensory-emotional events. The class contains many different types of pain, each of which is a personal, unique experience for the person who suffers. This growing awareness of the complexity of pain shows doctors that treating it involves the whole of a person's experience. The bio-psycho-social model of pain, widely used in chronic pain management, suggests that the biological, psychological, and social aspects of an individual's life all influence the way that person deals with pain. This has led doctors to develop multifaceted pain management programs--intensive courses, often run in hospitals, that offer in-depth help in managing the many ways in which pain has affected a person's life. Input is often available from a range of professionals, such as physiotherapists, anesthetists, occupational therapists, and psychologists. Mindfulness-based pain management is one such program. It combines the scientific view of pain with an understanding of the nature of experience that comes from the experience of meditation and mindfulness. These practices have ancient roots in the Buddhist tradition, but they augment scientific understanding in practical ways by offering methods to respond constructively to pain. How To Heal Yourself by Bernie Siegel, M.D. Holistic Health Newsletter. Click here to subscribe for free!